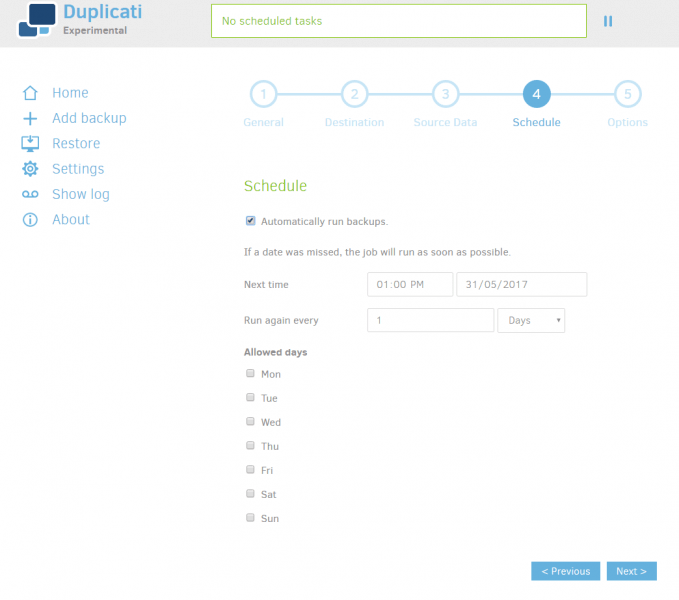 Duplicati Backup 2 is a versatile open source backup tool. It’s available for Microsoft Windows, MacOS, Unix, and Synology NAS. This short review is of the pre-beta experimental version, 2.0.1.53. 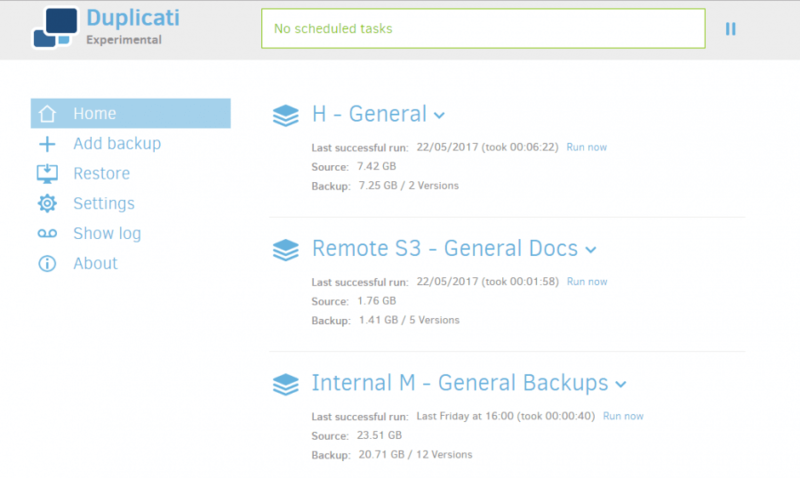 Overall Duplicati Backup 2 is a promising tool. It’s incredibly flexible, has great technology underpinning it, runs on multiple platforms, it performs well, and the web interface is polished reasonably easy to use. However this is pre-beta software, marked “experimental”. That’s a clear sign that the software isn’t ready for general use. I had a major problem with a restore from another computer, which turned out to be a known problem that no-one could help. It will be fixed eventually, and maybe I could’ve gotten the restore working, but the average person wouldn’t have any chance. My tip in this area is to accept the default settings, including block size and backup file size, unless you have a great reason not to. Compression and encryption are both available. Keeps a version history of backed up files. Allows you to configure when old versions are removed from backup storage. This is a simple setting based on either time or number of versions. Files that are deleted on the file system are retained in backups according to the version retention settings. The software is easy to install and use. The web interface is effective, looks good, and is easy to understand. It’s probably the easiest to use of all the software I’ve tested. There are many advanced options available, configured via advanced settings that are easily accessible. This is the Duplicati home screen. 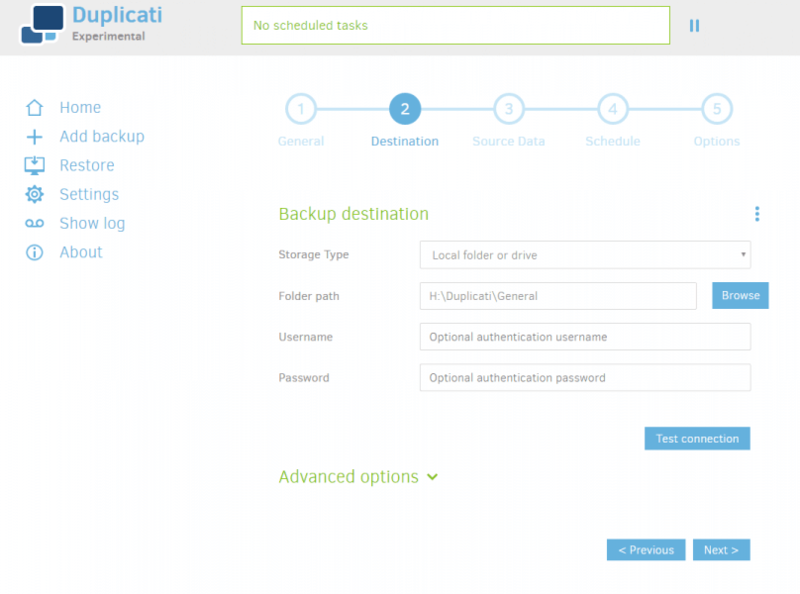 It lets you view details of your backups, run backups, see schedules, and access settings. This is the first screen of the add backup wizard, which lets you set the name and encryption. The next step of the wizard lets you define your backup destination out of the large range available. Next you choose the data you want to be backed up. This is fairly flexible. 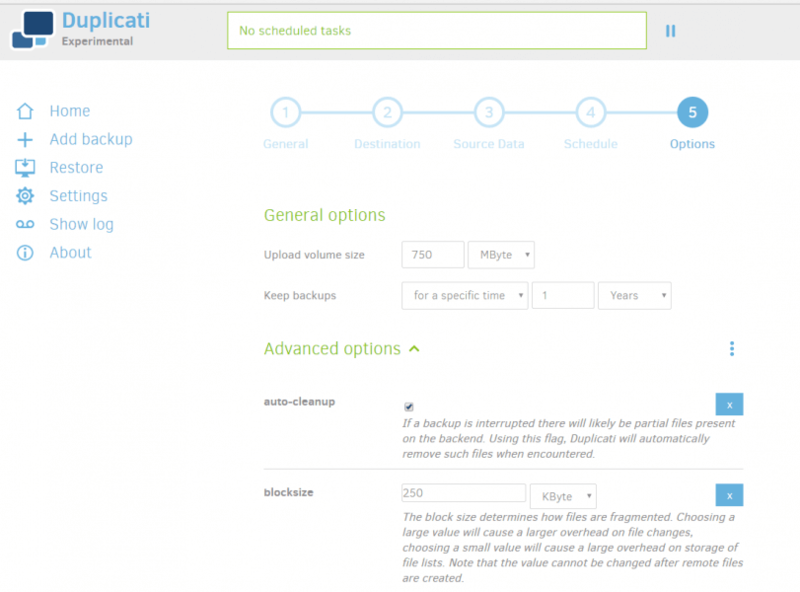 You can set a schedule for your backup, or leave them to be run manually. The options screen gives you access to the power of Duplicati. It’s also an area you could easily mess up. Restores are simple, from the computer that does the backup. From other computers they can be less successful. 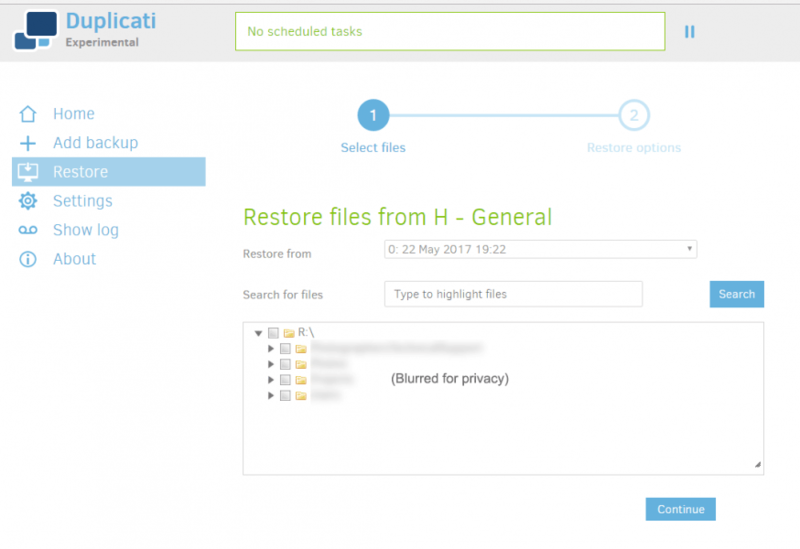 During a restore you choose the files you want to restore. Backup speed from an internal disk to an internal SSD varied between 10MB/sec and 30MB/sec. Surprisingly, large files were no faster than small files. Once a file was cached in RAM the backup didn’t speed up, which suggests it’s CPU limited. The CPU sat on 35% during the backup. This backup performance is one of the worst we’ve seen in our reviews. I expect that as the software matures this will improve. 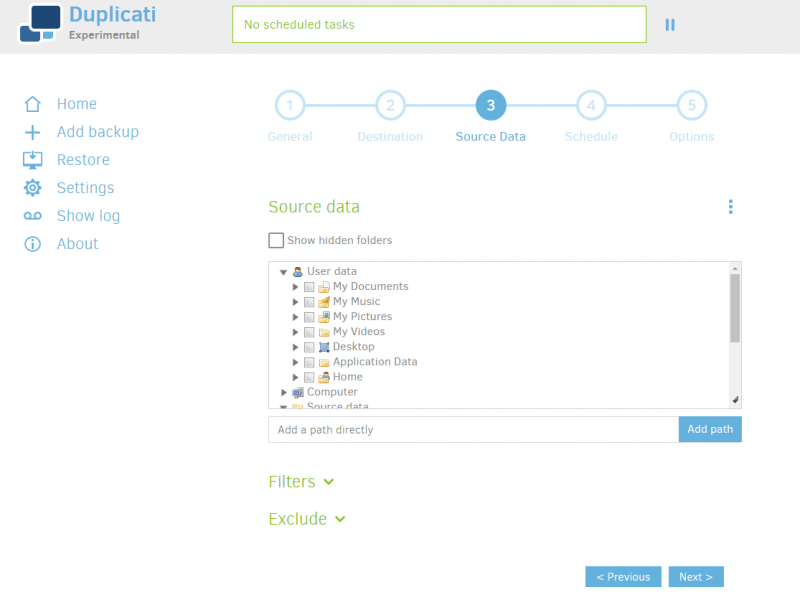 Duplicati seems to be excellent at both compression and deduplication. Backups are well compressed, if you enable that feature. Adding a second copy of a file to the backup set doesn’t increase the backup size, which shows deduplication works well. This was a real mixed bag. If you restore from the PC that made the backups it goes well. This is because the internal database has all the information about block size and such. Restores without that database should in theory work fine. The database can be rebuilt from the information stored in the backups. However I found that if you chose non-standard block and file sizes this completely failed, leaving you unable to recover your backups. There are options should should make it work, but they didn’t work for me. All in all I consider this a failure, making it largely useless as a backup product. Duplicati has a lot of potential. It has block level duplication, compression, it’s flexible, and easy to use. However restores are unreliable and performance is quite poor. For now my opinion is Duplicati is not suitable for use by anyone outside the development team. I will howeverwatch how the project develops with interest.